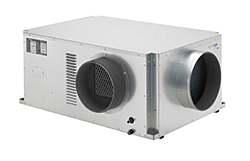 The CMW30 is designed for rooms that produce dense heat loads, but cannot be air-cooled due to lack of space. The water-cooled, ceiling-mount unit's cooling capacity is rated at 29,400 Btu/h total and 22,000 Btu/h sensible for computer rooms. Measures 20 inches high. Built-in mounting bracket, flanges and vibration isolators.